Located at Wrigley Field (in Chicago, Illinois) Janet Kuypers read poetry in an effort to get poetry out into the streets for the Chicago 2015 Poetry Bomb — too often writers read their work at poetry open mics and features, but things poetic can be seen everywhere in the world… This is why in this repeating annual venture, poets go out somewhere where people usually don’ read poetry, to perform it for people that are otherwise going about other business). The day of the reading, Kuypers also released (via Scars Publications, as a supplement release to cc&d magazine) a chapbook that she titled “Bases Loaded” an online PDF file chapbook the day of the event of the 2015 Poetry Bomb (available as a free download any time). 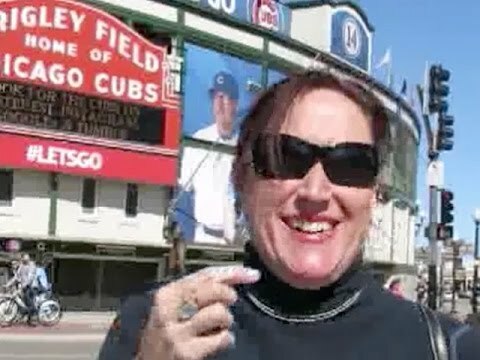 See YouTube videoof the Janet Kuypers 4/26/15 show “Bases Loaded” just outside Wrigley Field at the 2015 Poetry Bomb in Chicago (filmed with a Canon Power Shot camera), of poems relating to baseball. New Lyn Lifshin Poetry Book. Alive Like a Loaded Gun.